Christina Grof (1941-2014) was an author, teacher, artist, psychotherapist, founder of the Spiritual Emergence Network, and co-creator of Holotropic Breathwork. 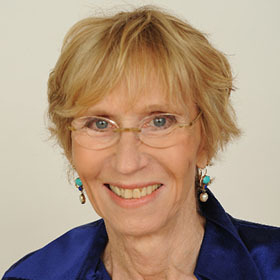 She was past-president of Grof Transpersonal Training, vice-president emeritus of the International Transpersonal Association (ITA), and an advisor to the board of the Spiritual Emergence Network. For over thirty years, she was active in the field of Transpersonal Psychology, which includes the spiritual aspects of human nature, as well as the emotional, mental, physical, and social aspects, as essential to a full understanding of the whole person. Raised in Honolulu, Hawaii, Ms. Grof was a graduate of Sarah Lawrence College, where she studied with mythologist Joseph Campbell and poet Muriel Rukeyser. A mother and wife, she was a former teacher of art, writing, and hatha yoga. From1976, she gave workshops and lectures in North and South America , Europe , Australia , and Asia. From 1976 until 1988, Ms. Grof was in residence at The Esalen Institute, Big Sur, California, where she and her husband coordinated and led a series of 28 experimental month-long educational programs, as well as numerous workshops. She also co-coordinated and participated in ten international professional conferences for the ITA (in Melbourne, Australia; Boston, Bombay, India; Davos, Switzerland; Santa Rose, CA; Killarny, Ireland; Eugene, OR; Atlanta, GA; Prague, Czechoslovakia; Santa Clara, CA; Manaos, Brazil), including “The Spiritual Quest, Attachment, and Addiction” (Eugene, Oregon, 1990) and “The Yearning for Wholeness: Addiction and the Spiritual Quest” (Atlanta, Georgia, 1991). From 1986, she taught at professional training programs in the United States and Europe, and training sessions for the staff at Sierra Tucson, an addictions treatment facility in Tucson, Arizona. In her last few years, she focused on writing and lecturing. Ms. Grof is the author of The Thirst for Wholeness: Attachment, Addiction, and the Spiritual Path (Harper San Francisco, 1993), her memoir, The Eggshell Landing (2014), and was working on a book of her paintings in her last years. Her other books, written with Stanislav Grof, M.D., are Beyond Death (Thames and Hudson, 1980), Spiritual Emergency: When Personal Transformation Becomes a Crisis (J.P. Tarcher, 1989), The Stormy Search for the Self (J.P. Tarcher, 1990) and Holotropic Breathwork: A New Approach to Self-Exploration and Therapy (SUNY Press, 2010). Each of her books was translated into many languages. Some of her published articles appeared in Crossroads: The Quest for Contemporary Rites of Passage, Louise Mahdi, Nancy Christopher and Michael Meade, Ed. (Open Court, 1997), Common Boundary, Re-Vision, the Spiritual Emergence Network Journal, Lotus Journal, and Honolulu Magazine. She had been interviewed on radio and television stations internationally and was the subject of newspaper and magazine articles. She was also a consultant on the feature film, Brainstorm (1980) starring Natalie Wood and Christopher Walken. Ms. Grof presented at programs and conferences such as those sponsored by the New York Legislature (“Rites of Passage: A Comprehensive Approach to Adolescent Development”), International Committee on Alcoholism and Addictions (ICAA Ross Hospital Addictions Department (Ross, California), Hazelden/ Betty Ford Center Women’s Conference, American Society of Addiction Medicine, The College of William and Mary (Project Taproot), University of Arizona Medical School, University of California Extension (Santa Cruz, Berkeley, Santa Clara), Santa Barbara City College Extension, John F. Kennedy Graduate School, The State of the World Forum, Marin Women’s Services, US Journal/Health Communications, Grace Cathedral (San Francisco), Institute of Noetic Sciences, The Fetzer Institute, Claremont Jung Society, Association of Transpersonal Psychology (ATP), Association of Humanistic Psychology (AHP), International Transpersonal Association (ITA), Common Boundary, East-West Foundation, The Healing Woman, VOICES, and the Spiritual Emergence Network, as well as by various European, Australian, South American, and Asian groups. Christina Grof died unexpectedly on June 15, 2014, of pneumonia.